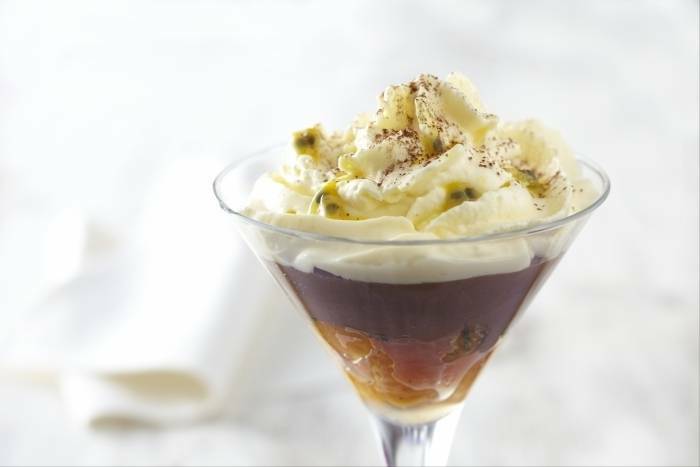 A rich chocolate mousse served with poached mandarins and topped with a passion fruit chantilly cream. Peel the mandarins and separate into segments making sure to remove all of the pith. Scrape the seeds from the passion fruits. Scrape the seeds from the vanilla pod. Place the sugar, water and vanilla in a saucepan and bring to the boil. Once boiling, add the basil leaves to the pan and cook for 5 minutes. Remove from the heat and place the mandarins in the syrup. Allow the mandarins to poach in the hot syrup for 10 minutes. Whilst the mandarins are poaching make the chocolate cream. Bring the 290ml of whipping cream and 30ml of milk to the boil in a saucepan. Break the chocolate into small pieces if necessary and place in a heatproof bowl. In another bowl, lightly whisk the remaining double cream and milk until it just begins to thicken. To assemble the dessert, place the poached mandarins in the bottom of a verrine. Spoon in a small amount of the syrup. Spoon the chocolate ganache on top and place in the fridge to cool for at least 30 minutes. Whilst the chocolate cream is setting, make the passion fruit cream. Mix the passion fruit purée, double cream and icing sugar together in a bowl. Pour the mixture into a syphon. Screw on the lid tightly and shake the syphon. Charge it with the compressed gas and refrigerate until ready to serve. To finish the dessert, remove the verrines from the fridge 5 minutes before serving. Top the verrine with the passion fruit cream and spoon over the seeds from the fresh passion fruit. Dust with some cocoa powder.